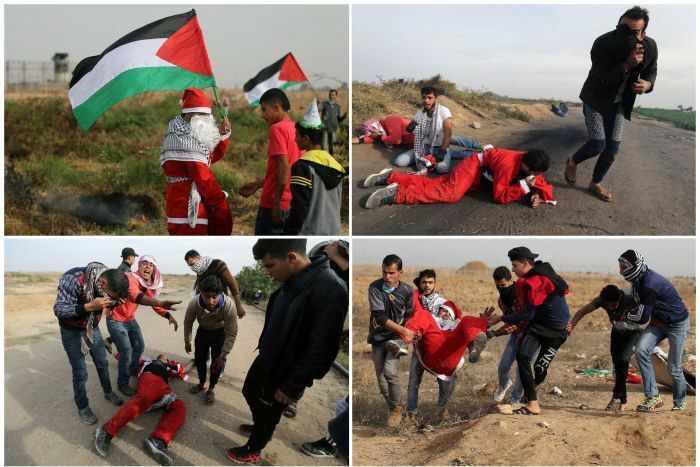 ‘Palestinian protestors (sic: Muslim rioters – CM), some festively dressed as Santa Claus (sic: “some wearing Santa Claus costumes to fool western useful-idiots into siding with their genocidal Jew-hatred” – CM) have clashed with (sic: rather “provoked and attacked” – CM) Israeli security forces (Jewish Israeli law enforcement officers and soldiers- CM) in Bethlehem (sic: that should be – “in Bethlehem in Yehudah” – CM), a day before the beginning of Christmas celebrations in the West Bank city revered as the birthplace of Jesus (sic: ‘in the city in historic Judea in the land of Israel where Jesus was born” – CM). ‘Holding Palestinian flags, the demonstrators, who gathered at an Israeli military tower to protest against (with the claimed excuse of protesting against – CM) U S President Donald Trump’s recognition of Jerusalem as Israel’s capital, were pushed back by the soldiers who also used stun grenades and tear gas to disperse the protest (sic: to repel the mob attack – CM). ‘There have been regular protests (sic: riots – CM) by Palestinians and pro-Palestinian groups across the Middle East (sic: by local Muslims and by other Muslims of assorted ethnicities in many places – CM) since Mr Trump announced his decision to move the US embassy to Jerusalem earlier this month. ‘Defying the United States on Thursday, the UN General Assembly (sic: The UN General Assembly, dominated by the Islamintern and its fellow-travellers, Muslim and non-Muslim Jewhaters and America-haters, Useful Idiots, and outright cowards – CM) approved a resolution calling for the United States to drop its December 6 recognition of Jerusalem – a city revered by Jews, Muslims and Christians (sic: the Jews’ central and most important historic and religious site, which isof significance to Christians because Jesus the Jew preached and died and was resurrected there, but to which Muslims – for whom it is in fact of negligible significance – lay exclusive claim in order to spite both Jews and Christians – CM), as Israel’s capital. ‘Resident of Bethlehem (sic; Muslim squatter in Jewish Bethlehem – CM) Mohammad Al-lahham said the Santa costumes were worn to send a message to Palestinian (sic: local Arab mostly-Muslim – CM) children. “Our message is a message to the children of Palestine (sic: Muslim children in and around Israel; whenever one hears the word ‘Palestine’ in a Muslim mouth one must bear in mind that such speakers always mean all of historic eretz Yisroel; and that our Mohammed Al-Lahham would envisage either an Arab Islamic state of “Palestine’ in which there were no Jews at all, all the Jews having been either driven out – as Muslim Jordan drove out and then kept out all Jews from the Old City of Jerusalem, when Muslim Jordan seized the heart of the City in 1948 – or else killed; or else in which there was an oppressed minority of Jews forced to live as Dhimmis, to be tormented at will by their rapacious and capricious Muslim overlords. – CM) that Papa Noel (Santa Claus) comes to the displaced and suffering people to give the gifts children of Palestine are deprived of”, he said. “Today we are dressed like Papa Noel to give gift which is the resistance on our land”. “A message to the children of Palestine is that we are on the path to freedom, to [get] Jerusalem. 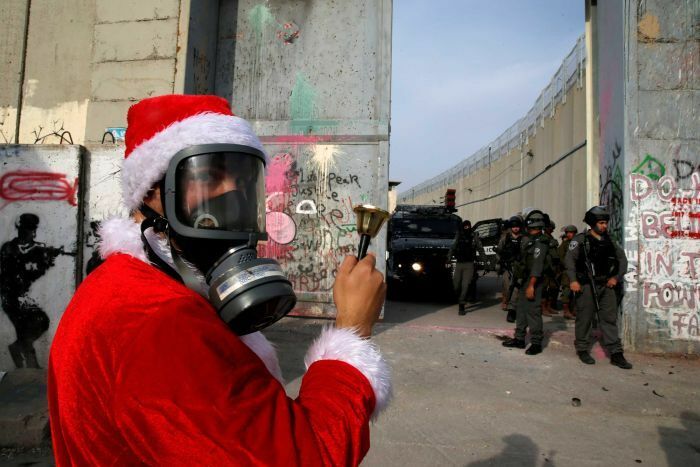 Papa Noel distributes gifts and the occupation distributes bombs today. (Nonsense-and-lies; the bombs are the suicide bombs that Muslims exploded, over and over, amongst the Jews of Israel, choosing especially to target locations where there were women and young children; it is the bombs that Jihad Armed Camp Gaza fires indiscriminately into civilian-inhabited areas of Israel, and which fail only because of Israeli cleverness and preparedness. – CM). These are the bombs that the Israeli occupation is distributing today, at Christmas.“…. Note well that sly and probably whining invocation of a festival for which, as a pious Muslim, Mr Lahham would in fact feel boundless contempt. Mr Lahham is a Muslim. Mr Lahham surely knows all about shirk, and not assigning partners to Allah, and therefore, despises Christmas, which involves the celebration of the birth of the incarnate Word of God; as a Muslim he is supposed to view the few Christians left in Bethelehem as people to be despised, abused, exploited, never befriended, though they are temporarily useful in the furtherance of the Jihad against the Jews. I would bet good money that Christmas is not something he himself cares two hoots about. He is merely making use of Christmas, as he makes use of Father Christmas/ Santa Claus, for propaganda purposes, for the Jihad. War is deceit. Click on the link and look at the pictures. Previous PostThe New Normal Is Too Horrible To ContemplateNext PostGermany used to be a fairly safe space for women. Then came Islam.